WASHINGTON — Matthew G. Whitaker runs hot. During the acting attorney general’s previous major public appearance, a Justice Department news conference, he perspired with the output of an oscillating sprinkler. Testifying before Congress for the first time Friday — an appearance he had threatened Thursday to skip — Whitaker again overheated: An angry scarlet rose up the back of Whitaker’s neck as new House Judiciary Committee Chairman Jerrold Nadler, D-N.Y.. asked him about his actions toward special counsel Robert S. Mueller III. As Nadler continued, Whitaker, alleging Democrats relied on “mere speculation,” noticed a red light had gone on. “Mr. Chairman, I see that your five minutes is up,” the witness said. 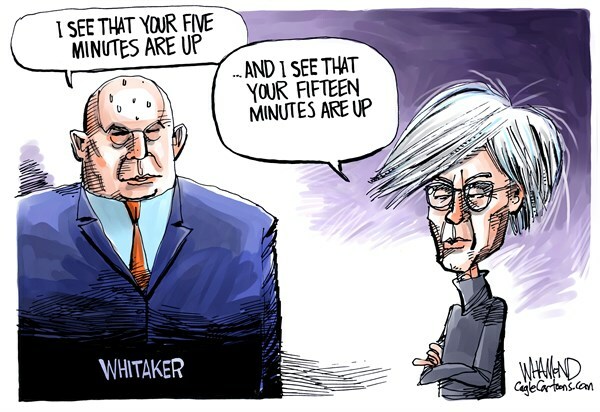 Actually, Whitaker is the one whose five minutes are about to be up. He’ll be relieved of his temporary duties in days, assuming William P. Barr is confirmed, ending the improbable tenure of an accidental attorney general. Before joining the Trump administration, Whitaker hawked hot tubs for a company that shut down and reached a settlement with the Federal Trade Commission. His main qualification to be attorney general, it appeared, was criticizing Mueller on TV. In a broader sense, Friday’s raucous, six-hour hearing was a vivid reminder that time has run out for the Trump administration. For two years, the GOP majority shielded Trump administration incompetence and worse from public view. That ends now. The scrutiny by the House’s new Democratic majority won’t necessarily stop bungling and impropriety, but now such behavior will no longer happen in darkness. On Thursday, the House held a subcommittee hearing that revealed that Trump administration officials were warned that separating migrant families would be traumatic and probably illegal. Also Thursday, a Ways and Means Committee panel probed ways to release Trump’s tax returns. Former Trump fixer Michael Cohen will meet with the House Intelligence Committee soon. No? Republicans launched scores of probes into Benghazi, Planned Parenthood, Internal Revenue Service targeting, Operation Fast and Furious, Hillary Clinton’s emails, Solyndra, Obamacare and more, with two select committees, hundreds of subpoenas and hearings into their final days in power. Trump’s congressional allies have taken his cue. At a Judiciary Committee hearing Wednesday about gun violence, Rep. Matt Gaetz, R-Fla., mixed it up with fathers of Parkland, Fla., shooting victims and attempted to get them tossed out of the room. Collins tried to adjourn the hearing before Whitaker was sworn in. Later, he demanded another unsuccessful vote to stop questioning about Whitaker’s background. It’s understandable that Collins wouldn’t want to go there, given Whitaker’s credentials. The patent company Whitaker advised before joining the Trump administration attempted to hype Bigfoot, time travel and a deep-bowl “masculine toilet” for well-endowed men. In response to a Senate Judiciary Committee questionnaire before becoming a U.S. attorney in 2003, Whitaker listed his two most significant cases as a personal-injury case and a negligence claim against a dry cleaner. But you didn’t need his resume to see Whitaker was in over his head. After proclaiming “I have nothing more to say” about the Mueller probe, he went on to answer Republicans’ questions about the probe extensively. After Whitaker told Rep. Hank Johnson, D-Ga., that he couldn’t say whether the Mueller probe is a “witch hunt” because it’s “an ongoing investigation,” Johnson asked him why he could talk about the investigation into Roger Stone but not Mueller’s investigation. “That’s a good question,” Whitaker allowed, without furnishing much of an answer. Even Nadler’s calling of a five-minute bathroom break fueled Whitaker’s indignation. “I get five minutes for lunch,” Whitaker blurted out. Yes, Mr. Acting Attorney General, five minutes. And yours are up.